The "County Marathon" is Unique! Our race is a fully sanctioned event on a fully closed course with all of the features you have come to expect at premiere running events around the world. We include free shuttle service to your event, water stations and port-o-potties every 4KM begin at the 4KM mark, massage therapists and awesome refreshments, including a local beer at the finish line! From the slowest walker to the fastest men and women running respectively for the Rolf Lund and Gayle Ornikova we take a back seat to no other race! 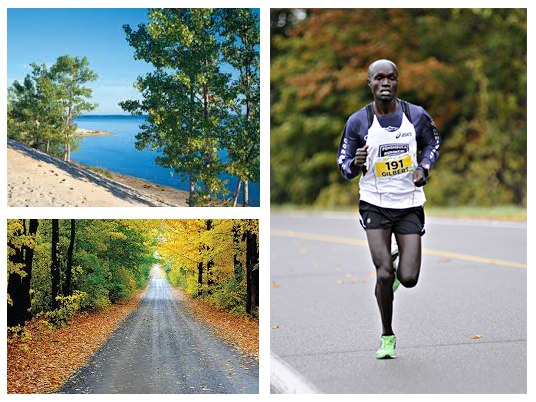 Welcome to our secret – the County and our marathon await you! This Boston Qualifier is sanctioned by Athletics Canada ON-2011-085-BDC and is an ORRA, AAA classified race. 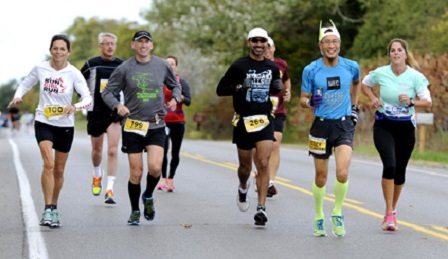 Described as gently rolling but fast by National Level Coach Peter Pimm, this October 1st expect a warm welcome from the residents of Prince Edward County as you run our fully closed course down the roads connecting Wellington, Bloomfield, and Picton. LOCATION: Prince Edward County Community Centre in Picton. You may have someone pick up your race kit for you, however it is then their responsibility to ensure you receive your tagged bib and race kit. Should you choose this option we are not responsible for you getting to the start line on time. The County Marathon finishes at our original line in front of the Prince Edward County Fairgrounds located in Picton. Please see the maps on our website for details as we approach the event. The awards ceremony will take place at the Community Centre in Picton (located behind the parking lot where buses will pick you up race morning - 375 Main St. Picton, ON). ALL buses on race day will depart from Picton at the Community Centre Parking lot as they have in previous years. The Full Marathon & Hospital Team Challenge start line is located in Wellington at the Essroc Centre, a warm and newly completed facility complete with washrooms, an indoor running track, fresh coffee, gels and water, as well as bag drop off. The Half Marathon start line is located in West Lake at the West Lake Community Church, complete with washrooms, a tent, fresh coffee, bananas, water, gel and fresh homemade muffins, as well as bag drop off. FREE Shuttle service to your start line is provided for every participant and will depart from The Prince Edward County Community Centre parking lot area race morning..